Kool-Stops Salmon compound is designed to standup to extreme conditions like wet, mud, and snow. I ride the streets most of the time to get to my ride destination, so brakes that I can trust due to bad drivers are a must. Also most of my main rides inclues a lot of hill riding, so downhill safety is what I look for in a brake compound. These pads fit the bill. I use these on my touring bike that sees heavy loads, commuting in all weather, and pulling a trailer with 70 lbs worth of kids. Salmon compound in necessary for the rainy season. Kool-stops are the best. Simple to swap out of brake shoes. Very strong braking with Avid Single-Digit 7s on my tandem. 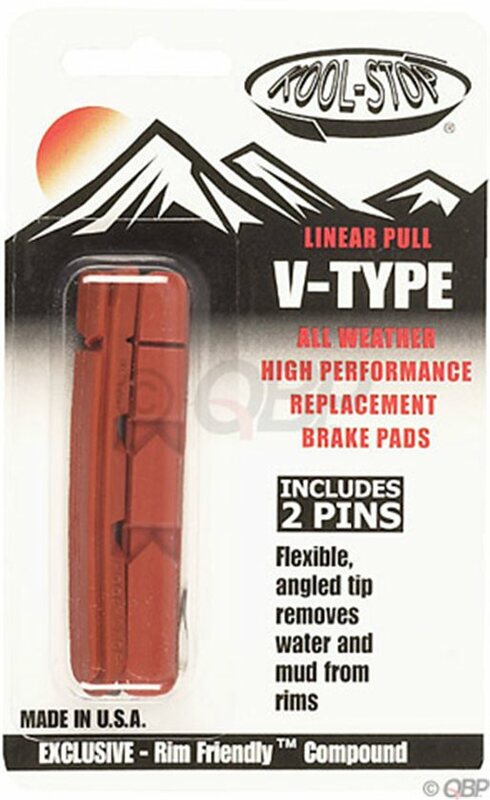 Use it on my touring / commuting spring, summer, fall bike. Reliable and predictable for 3 seasons regardless of wx. Inexpensive and easy on the rims if you keep em clean. Change them once a year, and no complaints. They install easily, come with a new pin & look great. They also stop you in the wet conditions. These are installed on a Trek STP that I use to commute 15-20 miles each day. Some road and some cinder trails. Even though I replace the pads every year I'm always surprised by how much better new pads work. Have tried Shimano pads and like these better. I do some wet condition riding and have found that there is actually a difference in that these work better when wet. Have also found that they don't wear out much faster than the regular compound units. In fact my yearly replacement is not for wear, it's due to the material hardening and not working as well. I used these pads to replace the stock pads on a pair of Tektro 720 cantis. I actually didn't think the stock pads were horrible, but after a couple years it was time to replace them and the Kool Stops were easy to instal and performed really well, including downhill braking on a rainin morning ride pulling a kiddie trailer. They work good. Seem to last a long time. Pretty pricey for what you get.